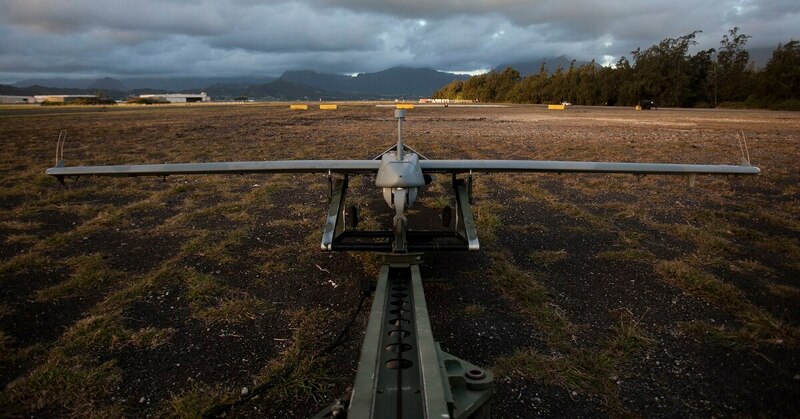 A small surveillance drone known as the RQ-7B Shadow made its last flight with the Corps on Sunday at Marine Corps Air Station Kaneohe Bay, Hawaii, according to Corps officials. The RQ-7Bs last flight with the Corps took place during the culminating event for the world’s largest maritime exercise known as the Rim of the Pacific. The tactical drone has been in the Corps’ arsenal for nearly ten years racking up 39,000 hours of flight hours over 11 deployments. And the unmanned vehicle has supported Marines in Helmand, Afghanistan surveilling Taliban movements across the rural farmland to spotting ISIS militants in support of U.S. forces in Iraq. The RQ-7B was also used to track ISIS militants in the Philippines. The first two Marine unmanned aircraft operators to earn the "R" device piloted the small surveillance drone in support of combat operations in the Philippines. The two pilots helped track targets and direct fires in support of allies battling ISIS militants in the region. The Philippine city of Marawi was by liberated in October by the Philippine military in a bloody five-month intense urban battle. The Marines flew unmanned aircraft to provide intelligence to local Filipino forces. But the Corps is in the midst of a changeover to the RQ-21 Blackjack, another surveillance drone that boasts the added capability of being launched from ships at sea. The Corps plans to equip the RQ-21 with the Intrepid Tiger II counter radar capability payload, which would provide electronic warfare support to Marines downrange. The Marines have invested heavily in drone technology over the past several years. On the Corps’ wish list is swarming suicide drones controlled by a single operator. Tests are currently underway where a Marine has already successfully operated six drones at one time. And a popular program pushed by the top Marine known as “Quads for Squads” has seen hundreds of small Instant Eye quadcopters pushed to rifle squads across the Corps. Lacking from the Corps’ emerging unmanned aircraft capability is a large group five drone. But the Corps is working on plugging that gap with its futuristic MUX drone. The Corps wants its large high-tech drone capable of landing on amphibious ships, electronic attack, and equipped with an airborne early warning system. The drone is still in the early stages of development as the Corps hosted its first industry day with potential builders in June. “We have employed this aircraft [RQ-7B Shadow] to the maximum extent of its capabilities in combat, with great effect. As we look to the future, we intend to do the same with the Blackjack, and leverage the expeditionary nature of the system to provide support anywhere in the world,” Lt. Col. Peter Ban, commanding officer for VMU-3, said in a command release.